As we kick off another day of trade we are (so far) witnessing another quiet, lower move in the futures market. Last week felt somewhat opposite to this one as the market drifted higher without much thought – or resistance. Turnabout is fair play I suppose. 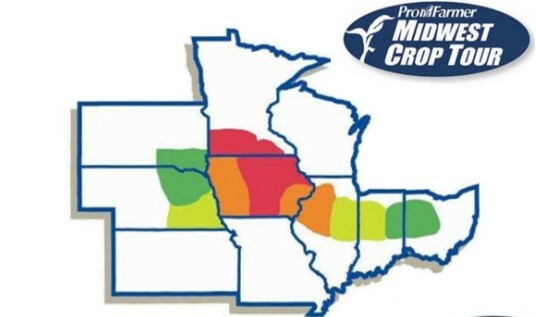 The somewhat surprising part about the price action this week is that it has happened amidst a steady stream of pictures hitting social media from the Pro Farmer Tour that show crops looking somewhat poor. While pictures can be cherry-picked to advance your agenda (I want $4 corn, I’ll tweet a pic of an ugly ear), the yields being reported are coming in below the USDA’s estimate. However, the trade is shaking that off as this tour tends to be light on yield anyways – which takes some of the ‘surprise’ factor out of it. Because of the track record for Pro Farmer to be on the light side, when digesting this info, we may need to look at it a little differently. For example, PF pegged Indiana at 173bpa this year and they had them at 143bpa last year. The USDA has Indiana at 187bpa this year and they had them at 150bpa last year. Instead of comparing the USDA’s 187 to the PF’s 173 – “that’s a 14bpa difference, somebody’s out to get us!” (I kid) – it may be better to look at the year-on-year change… Quick math in that state shows the USDA is calling for a 37bpa increase while PF is calling for a 30bpa increase. That 7bpa Indiana difference (while still pretty wide) is probably a little easier to stomach. Important to note that Iowa is the only state which gets sampled entirely by Pro Farmer (map below), the other states just get a portion. Overall, the market obviously isn’t bothered by the yield reports they have heard so far. Maybe that changes as they get deeper into Illinois and Iowa today/tomorrow – but generally speaking the weather forecast still looks good and the corn balance sheet is so flush with stocks that a little blip in yield can be somewhat ignored. Now, if they start taking US corn yield down into the 160’s – that’s probably the time to sit up straight and pay attention.